Smoking is one of the most important modifiable risk factors for the development of cardiovascular disease. The European Heart Network and the Dutch Heart Foundation initiated a statement to support the lobby for a Smoke Free Society by introducing plain packaging. Helping patients to stop smoking remains important for health professionals, but population level interventions are crucial as well. Motivating patients to quit smoking, or even preventing people from starting to smoke, is much more effective within a social and political environment that denormalises smoking and supports quit attempts. Therefore the European Heart Network and the Dutch Heart Foundation initiated a statement to support the lobby for a Smoke Free Society by introducing plain packaging. 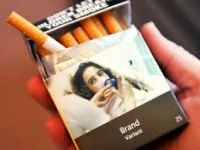 Plain packaging means prohibiting logos, colours, brand images or promotional information on packaging, other than brand names and product names, displayed in a standard colour and font style. It is an effective measure that governments must take to reduce the appeal of cigarettes, making it easier for smokers to quit smoking and less likely for youngsters to start smoking. Are you a (para) medical professional and do you support our fight against heart disease and stroke, and our call for a healthy smoke-free society? Sign the statement via this link.